In a society that judges every book by its prequel, how does one ever start afresh… forget about the pages gone by and set out to write a whole new story? We are a collective of people born and raised in the best of both worlds - a progressive, broad-minded world that lets one be independent and aspire to live every dream; and a world built on a culture that helps cement the feeling of love and respect in definitive, lasting relationships. Why is it then, that when it comes to falling in love again, we have to choose being in one of the two worlds? Why does our culture not let two people, who have been through a sour relationship and finally found the right person to spend their life with, go ahead and seal their love in immovable finality? Second marriage, for many, is still a taboo. And this story illustrates why it’s not. It’s a treatise on how the past doesn’t come in the way of love and respect. It’s a heroic tale of victory over stereotypes and archaic customs. It’s a story of how love always triumphs in the end. 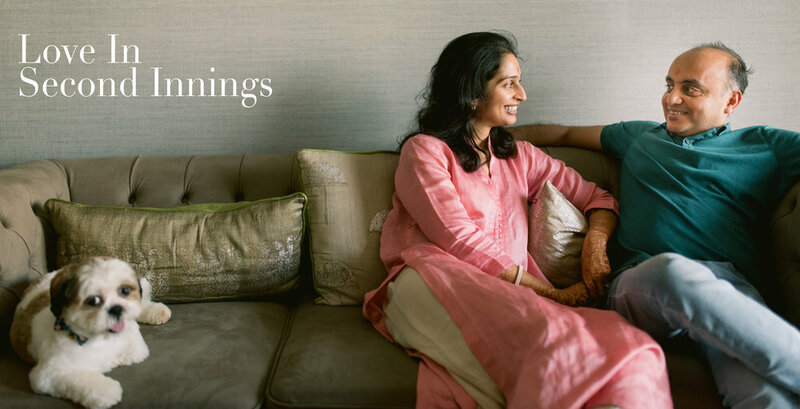 Every moment that we spent with Deepal and Nishant convinced us that life can be made beautiful… that tears can be turned into a drizzle of hope; that fear can be turned into the excitement of exploring the unknown; that the end is but a new beginning. Their love changed them in different ways but they also gave a different connotation to love itself . Their dog Winston is a furry embodiment of that change. Nishant, who disliked dogs, brought Winston into his life and grew to love it just because Deepal loves animals, especially dogs. To say that we are in awe of this couple would be an understatement. We can only imagine what they’ve been through. And we couldn’t be happier to witness and document their journey to a whole new world where there’s only happiness, fulfilment, and a whole lot of fun. Here’s to the two most beautiful people we’ve met… here’s to falling in Love in the Second Innings.